Dogs inside prison walls. 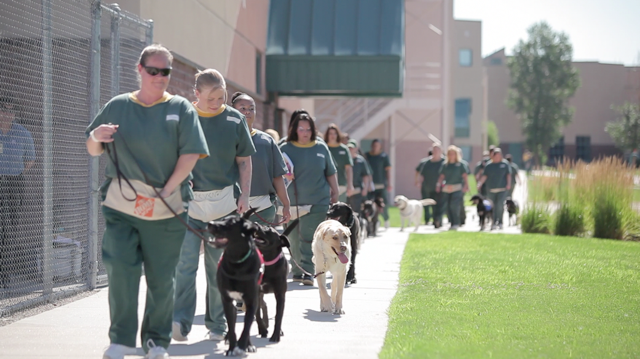 October 28, 2002, Colorado Correctional Industries(CCI), the cash funded division of the Colorado Department of Corrections, (CDOC) walked five, rescued from shelters, fully vetted, dogs into the dog prepared, Colorado Women’s Correctional Facility (CWCF). Five, interviewed, case management screened, hand-picked, offenders were waiting with brand new prison made leashes and collars. They stood inside the long, austere hallway. The five women looked like wide-eyed little girls on Christmas morn. All had their best poker faces on. The developed face that hides feelings of any kind, especially of the shame for making a mistake so bad they are locked away in prison. Shaking hands caressing fur, glistening eyes, an occasional tear snaking down a cheek, and wagging dog tails. 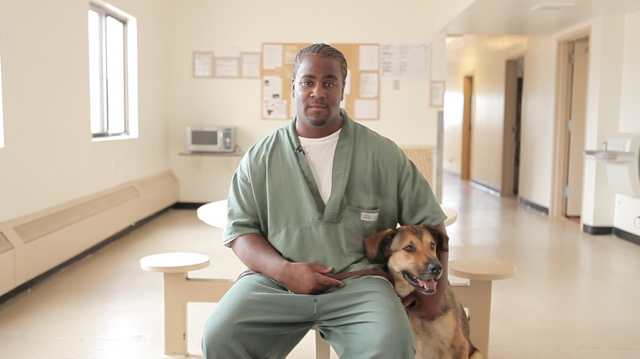 CCI’s Prison Trained K9 Companion Program (PTKCP) had begun. The PTKCP has rescued and vetted over 3000 dogs at this time, shouldering the expenses associated with housing these dogs in a shelter while saving taxpayers many expenses associated with euthanization. Another over 4000, privately owned dogs have come to the program for boarding-in training. Many of the 4000 come as a “last ditch effort” before losing their forever home. Funds collected from boarding-in training and adoption fees go to pay the bills for this Colorado State Licensed Animal Rescue. These bills not only include dog expenses, but also pay a small salary to the offenders. All CCI programs provide a benefit to offenders and a cost avoidance for Colorado taxpayers. Topping these benefits, offenders learn a vocation helping them to obtain employment when they return to the streets. Obtaining employment helps to keep them from returning to prison. The third win takes many forms. 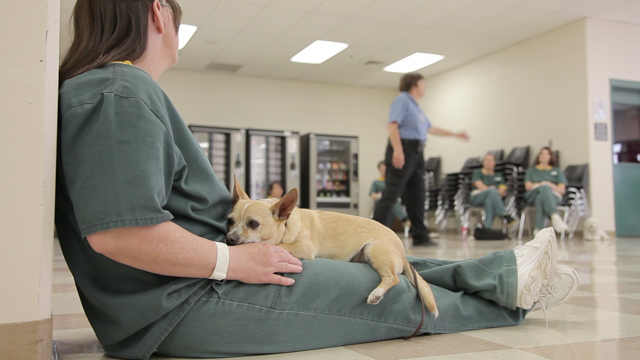 Most of the 3000 rescued dogs go to pet homes as a trained pet. Are they perfect? No. Most do succeed at staying in their homes. One of the shining features of the program is the on-going training program for the dog owners. Success has been found in changing the unrealistic expectations of many dog owners while teaching methods to deal with everyday life is the key. All adopted dogs are guaranteed for life with alumni classes. When an adopted dog placement fails, the dog owner is required to return the dog to the program. Dogs that have been boarded-in for the initial four week program also have alumni privileges. Specialty dogs placed through joint venture with programs such as the Stink Bug Foundation and Freedom Service Dogs are the reinforcement we all sometimes need. A trip to the web page of these organizations tells more about the special work a dog is capable of doing. The first of the Stink Bug placements was one of the most touching experiences ever. Meet Lucky Bug, a five year old black Labrador retriever. Big, tail wagging, gentle brown eyes, wondering, waiting for the man that had owned him since the day he left his mother, his master, to come get him. He did not understand, the man whom he had always served, had passed away, leaving him behind to his children who did not want him. So they took him to the Humane Shelter, where as an older dog, he had a chance of never leaving that shelter. His real name, “Lucky”, ironically his owner called him “Bug”. The program has had many dogs named “Lucky”. So “Lucky Bug” he became. He leaves the shelter and goes to prison. An offender in a prison reinforces the basic obedience he already knows and teaches him a few tricks. The first application from the Stink Bug Foundation is received. It is from a two-year old girl whose world became visually black because of the infringement of a malignant tumor on her optic nerve. The tumor is removed but the damage remains. She will always be blind. Other children find her different, a dog does not care, and will be her best friend. Her mother is single and cannot afford a dog, much less one that comes complete with training. Stink Bug helps her with the original expenses and helps set up support in her home community. The day comes for Lucky Bug to meet his new master, so different from the first. The meeting is to take place at the Denver Women’s Correctional Facility. The little girl’s mom enters the lobby holding her hand, she says, “It’s your puppy”. The sweetest, most angelic little voice questions, “My puppy, Mommy?” as she reaches out feeling Lucky Bug’s fur gently hugging his neck and burying her nose in his fur to smell him. Teaching and training done, Lucky Bug accompanies his new family to their little car. As his new master is strapped into her car seat, Lucky Bug jumps into the back seat laying his big head on the side of the seat. A little hand reaches out and gently holds and strokes his ear. Colorado Correctional Industries, Prison Trained K9 Companion Program…a win, win, win from the Colorado Department of Corrections!